** This post contains affiliate links. I will get a small compensation when you make a purchase. Thank you. It has become a struggle for my husband to complete his quality sleep because I snore like a dragon. As embarrassing as it is to admit it but I do snore so loud and it is regardless of my body size. I snored when I was young and skinnier. I snored more even when I was a teen. And I continued to snore as an adult. Now that I have packed the pounds, I have become the Mother Dragon of snoring! My hubby has been sleeping in the living room for a while now because he is losing sleep due to my incessant snoring. And he wakes up very exhausted because of lack of sleep. I decided to use the Good Morning Snore Solution because I have read good reviews about it. Let me share to you my experience and feedback about the product and why I recommend it. It is a mouthpiece used to stabilize the tongue to prevent making snore sounds while one is sleeping. It brings the tongue forward to clear the blocked airways. The GMSS is packed in a plastic blister and contains 1 Power Clean Crystal effervescent cleaner, a product info insert, and 1 GMSS mouthpiece. It is super light. It barely weighs anything, even when used. It has a universal size and will fit most people. There is not need for adjustments. The GMSS is made of high grade safe plastic resin used in many dental grade products. It is FDA cleared. It is also BHA and BPA free. The mouthpiece is also smooth so it doesn’t cause any friction inside the mouth. It is very easy to clean. I just soak it in water with a dental effervescent tablet and wipe with a fine cloth to dry and keep in a mouthpiece container. My initial use was not quite a walk in the ballpark while sleeping, since it is a soft mouthpiece, it doesn’t cause any friction which causes soreness when using other mouthpieces. Although, I just noticed that I drooled a lot when I used it. According to my husband who is the most affected by my snoring, he did notice an improvement when I used it. I was not snoring as much as I used too. There were little muffled sounds but they were not the loud snore that would also wake me up on some nights. I use it for 3-4 hours at most and would remove it because of hyper salivation. However, that is just a small inconvenience compared to the improvement in my snoring, and the quality of sleep we are having. I still have to get used to wearing this every night though. I skip few nights when I have blocked nose since this device lets you breath through the nose only. Wearing it with a blocked nasal cavity is not advisable as your mouth will be sealed off as the mouthpiece helps stabilize your tongue’s position in your mouth. It can’t be worn if you have blocked nasal cavity like colds, sinusitis, etc. 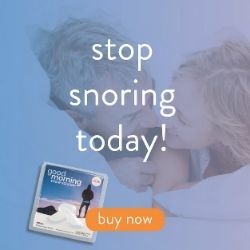 I do recommend the Good Morning Snore Solution to snorers like me who have been struggling hard to abate the snoring. It is embarrassing to talk about it let alone someone hears you snore. And I have a fair share of unpleasant experiences when staying overnight in a friend’s or relatives’ house only to cause so much inconvenience because of my heavy and loud snoring. And because of that, I always book a hotel as much as possible to do myself and others a favor. My snoring diminished when I used this device considering I am only using it for few hours at most. Like I mentioned earlier, I am still getting used to this device but the few nights I have used the GMSS, it yielded a good outcome. My snoring is less and my husband sleeps soundly. Use the code VALENTINE25 for a 25% discount until Feb. 14! T&C applies. Buy now. Click here if you want to View more testimonials from other people who have used this product.